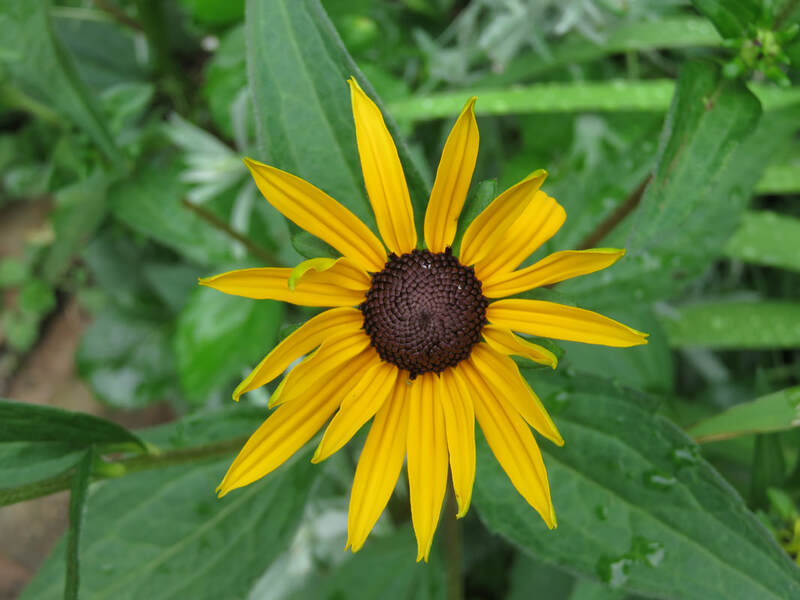 Common names: Black-eyed Susan, brown-eyed Susan, brown betty, gloriosa daisy, golden Jerusalem, English bull's eye, poor-land daisy, yellow daisy, yellow ox-eye daisy. Benefits to Wildlife: Attracts butterflies, bees, deer and rabbits. Gold finches are attract to the seed heads. Bloom Time: Mid summer - fall Exposure: Full or part sun Height: 12" - 39" Spread: 12" - 18"
Description: Rudbeckia hirta is an upright annual (sometimes biennial or perennial). It has alternate, mostly basal leaves long, covered by coarse hair, with stout branching stems and daisy-like, composite flower heads appearing in late summer and early autumn. In the species, the flowers are up to 4" in diameter, with yellow ray florets circling conspicuous brown or black, dome-shaped cone of many small disc florets. However, extensive breeding has produced a range of sizes and colors, including oranges, reds and browns. Cultivation: Fertile (not poor) though they can tolerate tough conditions. Black-eyed Susans may be cut back after they flower and a second, smaller bloom may occur in late fall, however, this might prevent annuals from self-seeding and returning the next year. Fertilizing: Not necessary. Too much fertilizer will cause plants to flop over. Soil and pH: Prefer moist, well drained soil, neutral pH. Propogation/Transplanting: Most Black-eyed Susans are annuals, and often self-seed.Plants may be started indoors, 6-8 weeks before the last frost date for your area. Seeds need light to germinate. Plant very shallow. If planting seed outdoors, plant seed when the soil temperature has reached 70°F for best seed germination. Plant seeds in moist, well-drained soil. Cover loosely In many parts of North America, the planting period is March to May. 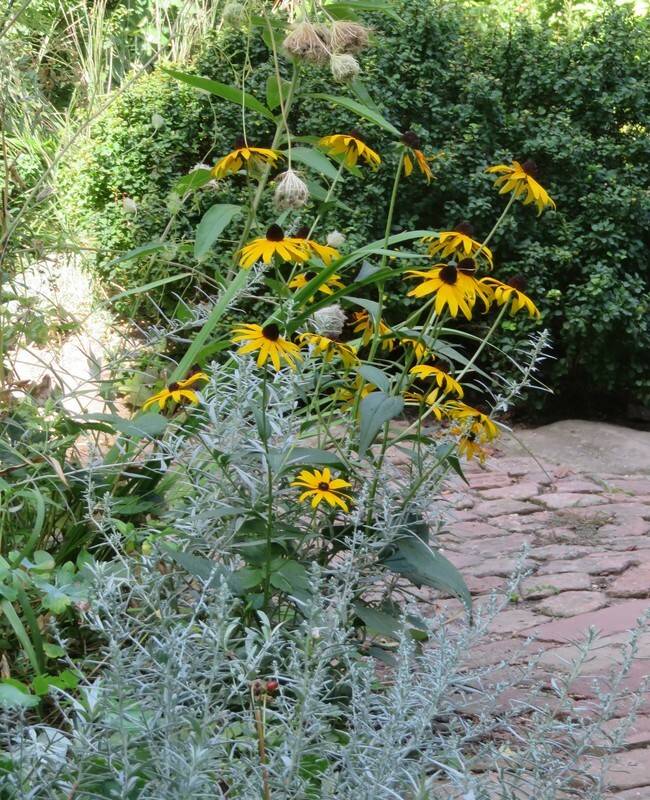 Divide perennial types every 3 to 4 years to ensure healthy plants and to prevent excessive spreading. Seeds usually germinate withing 10 - 15 days. Notes/Gardening Tips: black-eyed Susan, is a North American flowering plant in the sunflower family, native to Eastern and Central North America and naturalized in the Western part of the continent as well as in China. It has now been found throughout Canada and all 48 states in the contiguous United States. Rudbeckia hirta is the state flower of Maryland. The genus name honors Olaus Rudbeck, who was a professor of botany at the University of Uppsala in Sweden and was one of Linnaeus's teachers. The specific epithet refers to the trichomes (hairs) occurring on leaves and stems. The plant also is a traditional Native American medicinal herb in several tribal nations; believed in those cultures to be a remedy, among other things, for colds, flu, infection, swelling and (topically, by poultice) for snake bite. Parts of the plant have nutritional value. Not all parts of the plant are edible. The roots but not the seedheads of Rudbeckia hirta can be used much like the related Echinacea purpurea to boost immunity and fight colds, flu and infections. It is also an astringent when used in a warm infusion as a wash for sores and swellings. The Ojibwa people used it as a poultice for snake bites and to make an infusion for treating colds and worms in children. The plant is also diuretic and was used by the Menominee and Potawatomi peoples. Juice from the roots has been used as drops for earaches. Certain parts of the plant contains anthocyanins, a class of antioxidant with several known health benefits.